The recent attack on Pope Francis’s integrity and credibility regarding climate change and integral ecology during a recent broadcast on the Eternal Word Television Network (EWTN) is deeply disturbing. The Pope’s imminent encyclical on climate change and integral ecology, from all indications, will be rooted in fundamental Catholic understandings about creation that go back for centuries. In addition, he has consulted with a wide array of scientific and moral experts through the Pontifical Academies of Science and Social Sciences. The charge that he is being “duped” on the issue of climate change is entirely without foundation. As an interreligious organization the Parliament does not involve itself in the internal affairs of particular religious and spiritual communities. But we are convinced that the climate change issue transcends particularistic religious boundaries and we see Pope Francis as serving all humanity and the entirety of creation through this forthcoming encyclical. 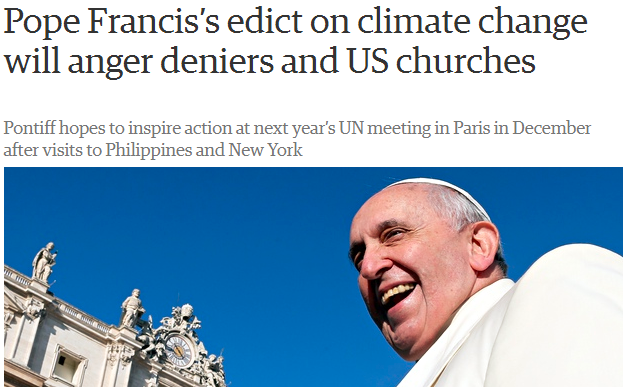 Hence we stand with Pope Francis in his global effort on climate change. Have the Parliament Blog delivered directly to your inbox!